(CNN) – On the day following his ceremonial inauguration, President Barack Obama received warm praise Tuesday while attending an interfaith prayer service at the National Cathedral. Rev. 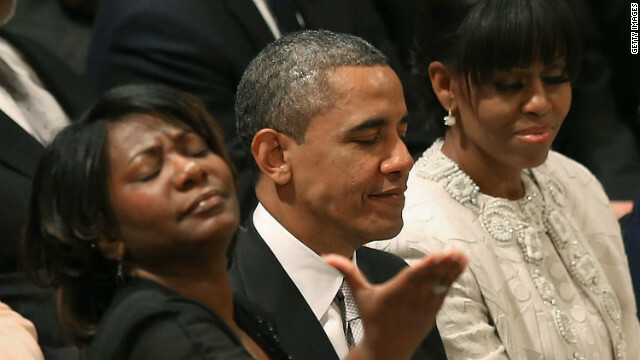 Adam Hamilton, senior pastor at the United Methodist Church of the Resurrection in Kansas, said Americans should "more often" give thanks to Obama and those who serve in higher elected office. Free speech helps educate the masses................POLITICIANS too ! Where do morals come from? BY the way ...................Splat goes a fairy in the sky !...............bye bye tinker bell ! Hey James Madison................religion has none it looks like.............with the comments on this blog. The Big question is ETHICS ! does religion have any ? Apr. 8, 2013 — At some point, scientists may be able to bring back extinct animals, and perhaps early humans, raising questions of ethics and environmental disruption. And NO ANGELS the pope KICKED them OFF the TEAM last year ! the wrong path is Adam and Eve ! Mar. 4, 2013 — The discovery and analysis of an extremely rare African American Y chromosome pushes back the time of the most recent common ancestor for the Y chromosome lineage tree to 338,000 years ago. This time predates the age of the oldest known anatomically modern human fossils. Remember : Adam had to POKE himself hard with his OWN BONE to create Eve. No god(s) needed................... Old. DNA works..................also catches crooks ! Apr. 23, 2013 — Ancient DNA recovered from a series of skeletons in central Germany up to 7,500 years old has been used to reconstruct the first detailed genetic history of modern Europe. The fact...............the earth is to old for this nonsemse ! Time to EVOLVE ! Apr. 24, 2013 — Scientists have long believed that lava erupted from certain oceanic volcanoes contains materials from the early Earth's crust. But decisive evidence for this phenomenon has proven elusive. New research from a team including Carnegie's Erik Hauri demonstrates that oceanic volcanic rocks contain samples of recycled crust dating back to the Archean era 2.5 billion years ago. Their work is published in Nature. For what...................... ? Make sure to read what the pope said ! Learning is fun with facts.......................... and facts work when teaching children. NASA: Three planets found are some of best candidates so far for habitable worlds outside our solar system. The ORIGIN story is bullsh-it...............so is the bible............... nasty ! Scientists have unearthed the first direct signs of cheesemaking, at a site in Poland that dates back 7,500 years. Decades before atheist scientist and author Richard Dawkins called God a "delusion," one world-renowned physicist – Albert Einstein – was weighing in on faith matters with his own strong words. The fact...............the earth is to old ...........time to EVOLVE !. Below are the complete transcripts from the Dover Trial. Thanks to our friends at the National Center for Science Education for helping us fill in the missing transcripts. "Earth From Space" is a groundbreaking two-hour special that reveals a spectacular new space-based vision of our planet. Produced in extensive consultation with NASA scientists, NOVA takes data from earth-observing satellites and transforms it into dazzling visual sequences, each one exposing the intricate and surprising web of forces that sustains life on earth. Viewers witness how dust blown from the Sahara fertilizes the Amazon; how a vast submarine "waterfall" off Antarctica helps drive ocean currents around the world; and how the sun's heating up of the southern Atlantic gives birth to a colossally powerful hurricane. From the microscopic world of water molecules vaporizing over the ocean to the magnetic field that is bigger than Earth itself, the show reveals the astonishing beauty and complexity of our dynamic planet. Hi.Hi there to Everyone. I am actually thankful I came across your blog. Now i'm wanting to get caught up. I've marked this for future reference and hope to be involved in future discussions. Many thanks. Keep praying, maybe we can pray this clown out of office. Since prayer doesn't work it will be 4 more years! Prayer.....doing nothing, but thinking you're doing something. You don't really read other people's replies do you? What you wrote had nothing to do with what I wrote. I was talking about Micah 6 which was written during the time of King Hezekiah, the one who built a tunnel to bring water into Jerusalem before the siege in 702 by the Assyrians. These are all historical events that are recorded outside of the bible as well. I was Agreeing with you, and letting you know the whole section of the Old Testament called the Prophets agrees with you as well. Without Abraham and Moses, the OT/Torah to include Micah (8th century BC) is basically fiction as is probably yahwew. least one or two goals or dreams that Americans on both sides of the aisle can come together and say, 'Yes, that's what it means to be American. That's where we need to go'." UNITY OF HUMANITY IS IN FOLLOWING OF TRUTH ABSOLUTE, ONLY LORD AND GOD OF THE UNIVERSE, FOUNDATION OF CONSTI TUTION OF UNITED STATES. HINDUISM CORRUPTION OF TRUTH ABSOLUTE, HINDUISM CRIMINALITY OF HINDU JEWS, CRIMINAL SECULAR S, SONS OF HINDU LUCIFER, DENIER OF TRUTH ABSOLUTE ATHEIST, WILL NEVER UNITE HUMANITY, BUT ALWAYS DIVIDE HUMANITY IN HINDUISM, RACISM. SITTING IN GLASS HOUSE AND THROWING STONES ON OTHERS WILL DO NOTHING BUT CRASH ROOF OVER THEIR HEADS TO BE BURIED UNDER THEIR OWN HINDUISM, DENIAL OF TRUTH ABSOLUTE RELIGIONS. HAVE NO DOUBT ABOUT IT HINDUS, IGNORANT S, FOLLOWERS OF HINDUISM, RACISM BY FAITH. TEXT YOUR MOTHER TO COME HOME. IT'S 2AM NOW. F*** PARTY EVERY NIGHT WHAT'S GOING ON SON? Oh she just called Dad. She has two more customers to go. She is bringing left over food too Dad. Are you coming? Please learn English or stop posting. You random hindu rantings make no sense at all! Way to go to Deify the president. Praise should go to the Lord, Thanks should go to the lord, not to a man. The Lord looks after the humble and brings the prideful down low. and who is she next too Obama? does anyone know? she is talking to God, in her mind. Is she crazy? In an effort to show his compassion for all citizens, Obama invites a homeless person to sit in on the service. As this person shakes hands with her imaginary friend, Obama prays he doesn't get attacked. Meaning, she still believes in the sky fairy and wants to show all around her that the sky fairy is within her. Or you can just call her crazy. @Roger – if she is a homeless person and standing next to Obama, Obama, hoping he was sincere in what he did, should get credit for being a nice person. Now on her part, if she is homeless, she should simply ask God, why HE made her homeless? I'm sorry, "Leave a Reply to Atheism is not healthy for children and other living things", but your repeated assertions regarding atheism and prayer are unfounded. Prayer does not; you are such a LIAR. You have NO proof it changes anything! A great example of prayer proven not to work is the Christians in jail because prayer didn't work and their children died. For example: Susan Grady, who relied on prayer to heal her son. Nine-year-old Aaron Grady died and Susan Grady was arrested. An article in the Journal of Pediatrics examined the deaths of 172 children from families who relied upon faith healing from 1975 to 1995. They concluded that four out of five ill children, who died under the care of faith healers or being left to prayer only, would most likely have survived if they had received medical care. The statistical studies from the nineteenth century and the three CCU studies on prayer are quite consistent with the fact that humanity is wasting a huge amount of time on a procedure that simply doesn’t work. Nonetheless, faith in prayer is so pervasive and deeply rooted, you can be sure believers will continue to devise future studies in a desperate effort to confirm their beliefs! What if I don't want things changed? Free Will and Future are inherent to all the thinking beings in the Universe. This being the case, it is not possible to alter life with prayers. Statistically, your request might come true but it is simply the result of the variability/randomness of Nature.. So put down your rosaries and prayer beads and stop worshiping/revering cows or bowing to Mecca five times a day. Instead work hard at your job, take care of aging parents, volunteer at a soup kitchen, donate to charities and the poor and continue to follow the proper rules of your religion or any good rules of living as gracious and good human beings. and to walk humbly with your God. This effectively sums up the Old Testament. origin: http://query.nytimes.com/gst/abstract.html?res=F20E1EFE35540C7A8CDDAA0894DA404482 NY Times review and important enough to reiterate. Adverb:	Almost certainly; as far as one knows or can tell). The entire Exodus story as recounted in the Bible probably never occurred. The same is true of the tumbling of the walls of Jericho. And David, far from being the fearless king who built Jerusalem into a mighty capital, was more likely a provincial leader whose reputation was later magnified to provide a rallying point for a fledgling nation. Such startling propositions - the product of findings by archaeologists digging in Israel and its environs over the last 25 years - have gained wide acceptance among non-Orthodox rabbis. But there has been no attempt to disseminate these ideas or to discuss them with the laity - until now. The United Synagogue of Conservative Judaism, which represents the 1.5 million Conservative Jews in the United States, has just issued a new Torah and commentary, the first for Conservatives in more than 60 years. Called "Etz Hayim" ("Tree of Life" in Hebrew), it offers an interpretation that incorporates the latest findings from archaeology, philology, anthropology and the study of ancient cultures. To the editors who worked on the book, it represents one of the boldest efforts ever to introduce into the religious mainstream a view of the Bible as a human rather than divine doc-ument. The notion that the Bible is not literally true "is more or less settled and understood among most Conservative rabbis," observed David Wolpe, a rabbi at Sinai Temple in Los Angeles and a contributor to "Etz Hayim." But some congregants, he said, "may not like the stark airing of it." Last Passover, in a sermon to 2,200 congregants at his synagogue, Rabbi Wolpe frankly said that "virtually every modern archaeologist" agrees "that the way the Bible describes the Exodus is not the way that it happened, if it happened at all." The rabbi offered what he called a "LITANY OF DISILLUSION”' about the narrative, including contradictions, improbabilities, chronological lapses and the absence of corroborating evidence. In fact, he said, archaeologists digging in the Sinai have "found no trace of the tribes of Israel - not one shard of pottery." Seems the spirituality bug is finally biting somewhere! Enjoy 2013 by following your own advice!